Bangkok Carp fishing for Giant Siamese Carp at Bungsamran Lake in Thailand affords specialist anglers the opportunity of fishing in Thailand for the largest cyprinid (carp) species in the world. 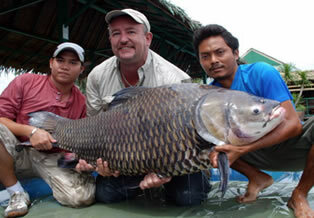 The Giant Siamese Carp in Thailand has been fondly referred to as the ‘Mother of all Carp’ and in its natural habitat of the wildest and most remote rivers in Thailand has attained weights in the excess of an incredible 100kgs+. The Giant Siamese Carp is the largest cyprinid (carp) species in the world and has captured many a carp angler and sport fisherman’s imagination due to its immense size and difficulty to catch. Bungsamran Lake in Bangkok holds the largest Giant Siamese Carp in Thailand and has previously produced monster sized carp to an astonishing eighty kgs. Bungsamran Fishing park Lake in Bangkok holds a large head of monster Carp and has received various stockings of this gigantic cyprinid in the course of the last twenty years of its history making it one of Thailand and Bangkok’s best carp fishing venues. Previous stockings of giant carp into Bungsamran Lake in Bangkok have included most notably the introduction of several gigantic wild Carp that were netted from the Chaophraya River some years ago, these Giant Carp are now believed to weigh well in the excess of an astonishing one hundred kgs. The Carp stock at Bungsamran Lake in Bangkok has been supplemented by further introductions of Giant Siamese Carp which were previously reared onsite before being released into the lake several years ago. The world famous Bungsamran Lake in Bangkok regularily produces Giant Siamese Carp weighing between twenty and sixty-five kg’s to anglers who are prepared to seriously target and fish for this most challenging of monster carp species! Carp fishing methods in Thailand and at Bungsamran Lake are a world apart from the traditional methods and equipment associated with carp fishing in the UK and Europe. Whilst carp fishing in Thailand at Bungsamran Lake short rods of 6-7ft with a minimum 5lb test curve are required to contend with the gigantic Giant Siamese Carp. By using shorter 6-7ft rods anglers are able to keep a much shorter line on any carp that tries to enter the sanctuary of the multitude of underwater snags in the lake. Large Shimano type spinning reels (Bait runner or similar) are best suited for the pursuit of Siamese Carp which are loaded with 65lb Power Pro braid and then attached to strong fluorocarbon leaders which serve to cushion the mainline from the various underwater structure that surrounds the lake. Large inline cage feeders or alternatively large 4oz Fox method feeders are used to deliver the bait to your chosen spot fished with a short 3 inch braided hooklength tied with a knotless knot to a size 4 Owner wide gape hook. Locally produced groundbait with additional flavourings of Butter Milk, Coconut Milk and other fruit based flavours is then expertly kneaded into the correct consistency by your fishing guide before being moulded onto the feeders in readiness for casting.The super sharp Owner hook is then popped up (made buoyant) with rig foam so that the hook sits directly against the large baited method feeder in the path of feeding fish. Whilst Thai Carp fishing at Bungsamran Lake the angler will be provided with the use of a stilted fishing bungalow allowing seclusion from other anglers. Anglers will be fishing to various visible features such as the submerged supports of nearby fishing bungalows and platforms or one of the petrol driven aerators which are placed in each corner of the lake. Your Thai fishing guide will also instruct you as to any underwater features which may hold carp such as depressions in the lake bed or areas where the carp have shown recently. The monster Carp at Bungsamran Lake in Bangkok are not shy to show themselves and regularly show at various points of the lake sometimes hurling themselves out of the water to the wrist of their tails! Fishing for Carp at Bungsamran Lake in Bangkok can be problematic due to the hordes of other monster fish which are also present in the lake. In an effort to avoid catching lots of Mekong and Striped Catfish the majority of carp fishing at Bungsamran Lake is in the edge. By avoiding fish based flavourings and using butter and milk in the groundbait mix we have found that the mix is much more attractive to the carp and less catfish tend to home in on the baited area. In the event of hooking a Giant Siamese Carp this wary but powerful freshwater species aided by its rudder-like tail will display immense amounts of power and speed stripping line from the tightened spool of the anglers reel. Battles with the awe inspiring Giant Siamese Carp are always long drawn out and protracted affairs which see the angler fighting to keep the carp from entering the snags! 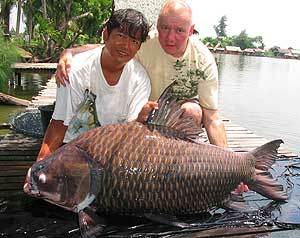 The capture of a large Carp from Bungsamran Lake in Bangkok is the ultimate prize for visiting carp fishing enthusiasts and has driven many anglers obsession to pursue the largest carp species in the world!With the incredible stock of monster fish that Bungsamran Lake boasts it is impossible to not catch Mekong Catfish whilst carp fishing at this record breaking venue! Bungsamran Lake is ideally situated in the district of Ban Kappi in Bangkok and is an obvious choice for serious carp anglers visiting Bangkok and Thailand. 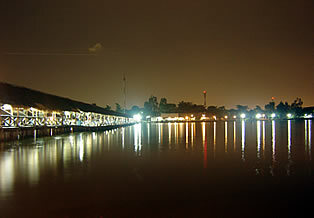 The daily itinerary for Thailand carp fishing trips at Bungsamran Lake in Bangkok is listed below. Carp and Catfish anglers visiting Bungsamlan Lake in search of Giant Siamese Carp and large Mekong catfish will be collected by a Fishsiam representative from their Bangkok hotel and transported to Bungsamlan via air-conditioned minibus. On arrival at this world famous venue the angler(s) will be equipped with all necessary tackle including one rod, one Shimano Baitrunner reel (or similar) and all relevant terminal tackle. In addition the angler(s) will be supplied with 40 kilos of groundbait known locally as lam and all additional bait additives. Carp Fishing is from a private bungalow to a prebaited marginal swim the angler(s) will experience hard fighting action from large Giant carp and Mekong catfish. A Fishsiam guide will be in attendance throughout your days angling to assist in bait preparation, netting of fish and photographic duties. The duration of our Bangkok carp fishing packages at Bungsamran lasts eight hours, it is advisable to time daily visits in pursuit of Giant Siamese carp in the mornings and evenings affording the angler the best opportunity to catch the highly sought after ‘mother of all carps’. At the end of the days fishing the angler(s) will be transported back to your Bangkok hotel by air-conditioned minibus. 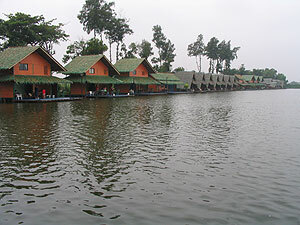 Fishsiam offers daily trips to Bungsamran Lake in addition to weekly holidays. Bungsamran can also be combined in our tailor made holidayss which are designed to meet the specific requirements of the visiting angler. Fishsiam has accounted for numerous Giant Siamese carp weighing upto sixty kilos plus in addition to Mekong Catfish to an estimated ninety kilograms from Bungsamlan Lake. Please note that our Bungsamran Lake Carp fishing packages now only allow fishing with one rod due to recent price increases made by the owner of the lake. An additional rod can be added at further cost.